Holeman Inc. has earned the service industry’s coveted Angie’s List 2015 Super Service Award, reflecting an exemplary year of service provided to members of the local services marketplace and consumer review site. 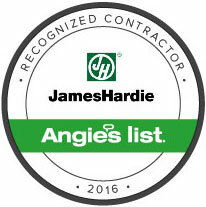 Holeman Inc. is the ONLY fiber cement siding installer in Southeast Florida to earn Elite Preferred Remodeler status from the James Hardie Corporation and a Super Service Award from Angie's List. We have been a Screened & Approved siding contractor with Home Advisor for more than five years. As a James Hardie® Elite Preferred Remodeler, you can hire Holeman Inc. with confidence, knowing that we will install your fiber cement siding and trim from the James Hardie® family of products in accordance with manufacturer specifications. James Hardie® products are low maintenance and come with a 30-year limited product warranty. Hardie’s newest line of products with ColorPlus® Technology is pre-painted with a factory applied, baked-on finish that is protected by a 15-year limited warranty. When you choose James Hardie® siding, you do not have to sacrifice beauty, charm, or character for reliability. Let us show you how Holeman Inc. can transform the exterior of your home and create instant curb appeal. Decided to remodel rather than build a new home? Want a low maintenance exterior that is impervious to termites and resists rotting, warping, and cracking? Want to increase your home’s resale value and curb appeal? Looking for a durable material engineered for Florida weather conditions? Searching for that “Key West” or “Old Florida” look? Seeking an alternative to wood that still has that real wood grain look and feel? A representative from Holeman Inc. can meet with you at your home to introduce you to the full line of James Hardie® fiber cement products. After this consultation, we will provide you with a free written estimate. Then, if you decide to proceed, we will help you bring your “vision” to life.